GetIsOwnedByPlayer() - This returns TRUE for a player's Main PC (*) object regardless of whether the player is currently possessing it or not. GetIsPC() - This returns TRUE on a PC or creature object if the player is possessing it at the time. GetControlledCharacter() - If this is used on a PC or creature that the player can control, then it will return the object that the player is currently controlling. (Returns OBJECT_INVALID if creature is not one that can be controlled.) After more testing with this function, I am not sure I have this right even now. 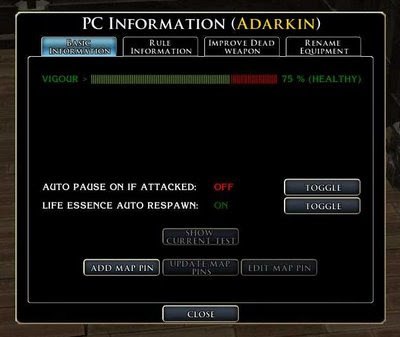 (*) For those that don't know, the term Main PC (or Owned) is used to differentiate the PC that the player joins the module with as opposed to any others they may add either through party creation or as companions. All this function revision was a prelude to ensuring I could give players the most flexibility when playing their PCs in a party. Whether playing SP or MP, I like to be able to give the player as much versatility with their PCs and how to control them as possible. In a MP game, however, where more than one player controls the same party (even if each player controls their own "team" within that party), extra coding is required to ensure everything plays as it should. And what if the players want to rearrange the teams? To give players more autonomy over their selected PCs I had to edit my own companion conversation script and include within it an edited version of the #include "hench_i0_hensho" script to ensure the correct "team leader" was listened to with respect to shouted commands. It was as I was testing this and began swapping between the different PCs when I discovered the problem that companions would revert to following the original party leader rather than the team leader whenever a player changed the PC they were possessing. This problem is what led me to learn more about the possession/unpossession hooks of which I will explain in more detail next. By default, the companions and the player's Main PC are assigned the same scripts. You can check this out by examining the nwn2_scriptsets.2da. Note though, the scripts do not fire for the Main PC until the player possesses another creature, so no player HB shortcut there. ;) However, this is useful information to know, and editing the nwn2_scriptsets.2da can be a very powerful tool. Add to this knowledge that you can also assign a new set of scripts to a creature using the SetCreatureScriptsToSet function and you have started along a path of interesting AI possibilities. I mentioned all this to draw attention to the nwn2_scriptsets.2da. If you look at it closely, you will notice two scripts in particular in the ScriptUserDefine column for when a player is possessing a companion (gb_player_ud) or not (gb_comp_usrdef). And when these two scripts are used correctly, we can tell when a player has possessed or unpossessed a PC. By experimentation, I found the gb_comp_usrdef fires when a player unpossesses a PC and the gb_player_ud fires when a player possesses a PC. If you remember this, you can use OBJECT_SELF in each script for the creature it refers to. For me, this newly discovered knowledge will serve me in a couple of ways. (I say will, as I still have to make use of it in some of the things I mention next.) Firstly, it will allow me to quickly change the player who is controlling a PC. For instance, I can now easily change the object variable representing the player who now possesses a PC. i.e. The moment a player switches to another PC, this player will now be the one whose commands the PC will respond to. Currently, the player controls this by a conversation with the PC. Secondly, and for me a performance saver, I can use these scripts to determine if the Main PC Menu (GUI) requires its data updating for viewing a different PC. Previously, I was relying on a function's internal heartbeat to keep checking the PC state while the GUI was open. Now, the same function no longer has to loop through itself making the check, as the hook is now intercepted with this new possession/unpossession function discovery. That possession & unpossession information is quite valuable--I had no idea how the game handled that, to be honest. Does the auto-pause feature only work on attack, or does it work also with trap damage too? POLL: What Gaming Style Do You Like?